There is always something bizarre about a book that manages to feel so familiar and yet unfamiliar at the same time. This is how J.D. 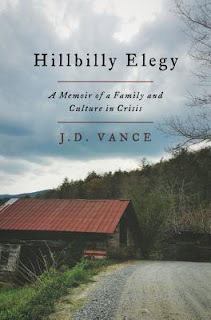 Vance’s Hillbilly Elegy: A Memoir of a Family and Culture in Crisis felt to me. While this book has exploded in popularity due to the strange 2016 election year, it is not simply a book to help people understand “Trump voters” as it has been marketed. Rather, the book is both reminiscent of people I’ve known and eye-opening to a world I often forget exists. In literature, an “elegy” is a long poem that is a lament typically for someone who has passed away. Vance’s memoir is not a poem, but it an elegy of sorts. The memoir recalls his unique life while also mourning the lives of others who come from similar cultures. Part of why this elegy is effective and why it is has caught the public’s eye is because it forces the reader to view a part of society that American has forgotten. White poverty, failing schools in these poor areas, and drug addiction to name a few. If this election year has taught us anything about our country, it is that we are divided. Every day you can turn on the news or look on different internet feeds to see rapid division. But, those divisions do not accurately portray all of America. A large group is missing – the “hillbillies” of the Appalachian mountain region. I very seldom see or hear people discussing the plights of these mountain folks or hear about causes being promoted to help benefit them. They have somehow fallen through the cracks. While many will say this book is “the book” to help the liberals understand “Trump voters,” I do not think this is the case. It is memorable, certainly. But, I think the audience misses the purpose if they just read it and leave it. Instead, people must try to remember when they rant and rave about how the other side thinks that there may be a history so deeply ingrained that the other side cannot imagine life another way. It is what they know. It is all they know. Aside from politics, the book captured my attention because I recognized people in it. I do not come from a line of mountain people, but I do have strong Southern roots. I know a thing or two about big families, family loyalty, family secrets and family heartbreaks. I am blessed to have a pack of aunts, uncles and cousins who would come swinging or toting if I needed them to. My mom is one of 10 children. My cousins are countless. The Spivey name was known in the town I grew up in. Vance discusses family loyalty in regards to sticking up for and defending your family no matter what – with violence in most cases. In elementary school, I had one cousin walk me home from school everyday and once threaten some boys who were picking on me with words scary enough to make them run. Another cousin punched a kid square in the jaw for pulling my hair on the playground. So, Vance’s stories about defending his family were familiar. However, I was unfamiliar with the vicious cycle so many of the poorest among us face in their efforts to achieve the American dream. Is it really possible? Are the cards fairly stacked? Is it possible to change it and how do we? If you are prepared to be moved, have your ideas tested and also be entertained, I recommend reading Vance’s Hillbilly Elegy. You can purchase it here or put it on the hold list at your local library. I completely agree with your thoughts on Hillbilly Elegy! I don't know why this was chosen by news media to be the explanation for the results of the election, but as a memoir, I really enjoyed this book. Especially foul mouthed, crazy Mamaw.